Perelandra Large Tote - Perelandra Ltd. Whether it’s from room to room or across town, it's not easy to carry around all the materials needed for the Perelandra processes (especially the Microbial Balancing Program). Introducing the Perelandra Tote Bag. Made of 15-oz. 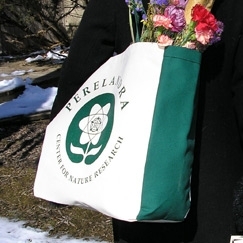 unbleached cotton and manufactured environmentally in the United States, the Perelandra Tote Bag has room for your books, balancers, essences and charts. It stands up for easy storage in a closet. But this doesn't mean you can't use it for shopping or as an over-sized shoulder bag.